Is There More To a Checkup Than the Cleaning? A Dentist Says Yes! Is there anything better than the slick, smooth, super-fresh feeling you get after a professional dental cleaning? It may not be your favorite thing to do, but it definitely feels great when it’s all said and done! But let’s face it: aside from the cleaning and a quick check for cavities, there aren’t a lot of reasons to go to the dentist every six months, right? Think again! Since this is a common misconception, we thought we’d write a blog about some of the other important aspects of your oral health that we examine every time we see you. Unfortunately, oral cancer is on the rise. 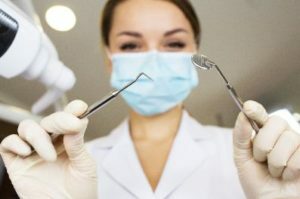 The good news is that, even though you may not realize it, both your dentist and dental hygienist perform an oral cancer screening for you at every checkup! This typically takes less than 60 seconds, during which we visually inspect your tongue, throat, and the roof and floor of your mouth for anything abnormal. We also examine the lips, as they’re a common spot for a type of skin cancer called melanoma. Gum disease affects an estimated 65 million Americans! This common condition damages the gum tissue and underlying bone that supports the teeth. Advanced gum disease can lead to tooth loss, so we always examine your gums during your checkups to make sure we catch it early. The temporomandibular joint can have a huge impact on the quality of life if it isn’t functioning properly. Pain in the joint, headaches, popping or clicking, and lockjaw are all symptoms of this condition. During your exam we can see if you have signs of clenching or grinding, which can contribute to TMJ. We can also gently feel the joint on both sides to see whether it’s moving correctly as you open and close. Sleep apnea is a condition in which someone’s breathing frequently stops and starts while sleeping. It can lead to a number of serious side effects, including weight gain, diabetes, daytime fatigue, accidents, high blood pressure and heart problems. By asking the right questions, we can determine whether you could benefit from a sleep study that can diagnose this condition. If you are diagnosed we can offer treatment options, such as an oral appliance that can help you breathe normally. Both your hygienist and dentist are looking for signs that your brushing and flossing technique and habits are good. Even with cleanings twice a year, what you do at home the other 353 days of the year has an equal impact on your oral health! As such, your checkups are an opportunity for us to make suggestions, like a small tweak in how you hold your toothbrush or a special hygiene aid that can help you be much more effective. Going to the dentist every six months is a lot like having your car maintained with regular tune-ups. It’s an opportunity to find any problems when they’re small and easier to fix. Remember, an ounce of prevention is worth a pound of cure! Dr. C.J. Landry is a ‘dentist near me’ who is dedicated to providing the most comprehensive dental care possible to all of his patients. He knows that prevention and catching problems early are crucial for the best treatment outcomes. If you have any questions, he can be reached through his website or at (504) 348-0080. Comments Off on Is There More To a Checkup Than the Cleaning? A Dentist Says Yes!